Current international relations (IR) theories and approaches, which are almost exclusively built in the West, are alien to the non-Western contexts that engender the most hard-pressing problems of the world and ultimately unhelpful in understanding or addressing the needs surrounding these issues. Our supposedly revolutionary new concepts and approaches remain largely insufficient in explaining what happens globally and in offering lessons for improvement. This deficiency can only be addressed by building more relevant theories. For theory to be relevant in accounting for contemporary international relations, we argue, it should not only apply to, but also emanate from different corners of the current political universe. In other words, diversity and dialogue can only come about when periphery scholars do not just "meta-theorize" but also "theorize." 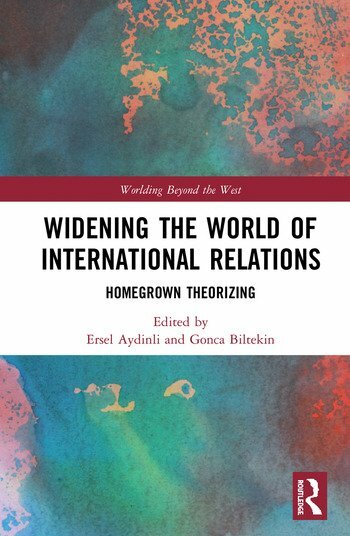 Aydinli and Biltekin propose a new form of theorizing through this collection of work, one that effectively blends peripheral outlooks with theory production. They call this form "homegrown theorizing," or original theorizing in the periphery about the periphery. Arguing that disciplinary culture is oblivious to the diversity that might be achieved by theorizing based on indigenous ideas and/or practices, this book intends to highlight that potential, showing diversity in the background of the authors, because wherever one looks at the world from, paints the picture that is being seen. Therefore, we bring together scholars from Eastern Europe to South Africa, from Iran to Japan to cover the extant diversity in ideas. This work will be essential reading for all students and scholars concerned with the future of international relations theory. PART II: Theorizing at "Home"
Ersel Aydinli, Bilkent University, Ankara. Gonca Biltekin, Binghamton University, USA.